Writing is cathartic. It's a release of emotion onto the page or screen that allows a writer to feel free. Whether the result is brilliant or not, it's still meaningful for the writer. Such is the case in Ethan Andersen's HeadVoice. A semi-autobiographical piece, HeadVoice follows a youngster writing a musical to escape reality. But his process is assisted by the voices in his head. The concept Andersen prescribes is clever but gets stuck in the mud of multiple ideas. The rules of HeadVoice are a bit unclear, inconsistent, and congested. Eric, the name of Ethan's stage persona, claims he is in control of his thoughts yet his thoughts go rogue multiple times. The trio of thoughts are supposed to represent Id, Ego, and Super Ego but you'd only know that if you read the promotional material. They are forced to play characters of Eric's musical and flip flop their knowledge of the true events to come. Even without this knowledge, it really doesn’t have much a baring on the characters. The book is in need of incredible cleaning up. What HeadVoice does do is showcase Andersen's flourishing musical talent. The score Andersen has scribed is beautiful. He gives loving nods to many musical theater staples within his original material. Andersen is a smart writer. He knows how to write an incredible song. He taps into the "write what you know" mold well. Some of his songs can stand alone outside of the context of HeadVoice, which is an indication of strong writing. 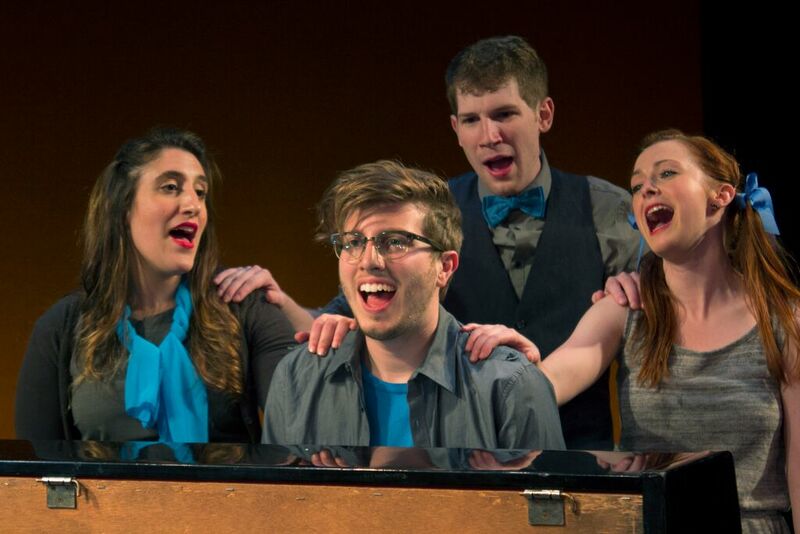 Following in the footsteps of the autobiographical musical mold of Lin-Manuel Miranda and the NYMF darling [title of show], Ethan Andersen takes his life, throws it on stage and puts himself in it. Andersen is at least self aware at the potential of being tacky. Knowing yourself is certainly a way to enforce a well-rounded character but the trick is if HeadVoice can exist sans Andersen. Sadly, it may not be able to stand alone. As Eric, Andersen is positively charming with an infectious smile. You can’t help but to smile along with him. He wears his heart on his sleeve. As the voices in his head, Nicole Dalto, Katie Emerson, and Matthew Summers succeed majorly with their beautifully tight harmonies. As a unit, they thrive as one. When they break out into their individual moments, it’s Katie Emerson who shines the brightest. Emerson is not only fun, she’s vibrant and explosive. Her energy is contagious, especially when she brings the house down with “Tickle My Iv’ries.” Nicole Dalto, who steps into the mother role of Eric’s story, takes time to warm up to. But you can’t help but become overwhelmed with emotion during “Float.” When Dalto sheds a tear, you do too. Matthew Summers may not have the strongest voice of the bunch but he certainly has fun. Summers plays up the geeky type but sadly it becomes a bit linear after a while. Simplicity was the key to HeadVoice. Director and choreographer Charlie Johnson knew just exactly how to tell this story. With a piano, three chairs, and a door to work with, Johnson varied his staging and generated some stunning stage pictures. Johnson honored the theatricality of the musical, contributing some snazzy moves on stage. Aiding in the beauty of the show was lighting designer Alicia Varcoe. Her diverse range of color set the mood of emotion throughout. The only design faux pas was the door. The color scheme Johnson used was blue, black, and gray. And for the most part the color language remained consistent except the tan of the door. Being the only aspect that was different, it stood out. Ethan Andersen has some wonderful potential going for him. HeadVoice is a wonderful showcase of his musical talents. But with the book needing much repair, the best option may be to hook up with a book writer to create a brand new original musical. Something less personal.